The emperor penguin is the tallest and heaviest of all living penguin species. They spend their entire lives in Antarctica – the earth’s southernmost continent – where temperatures average at around -60°C. 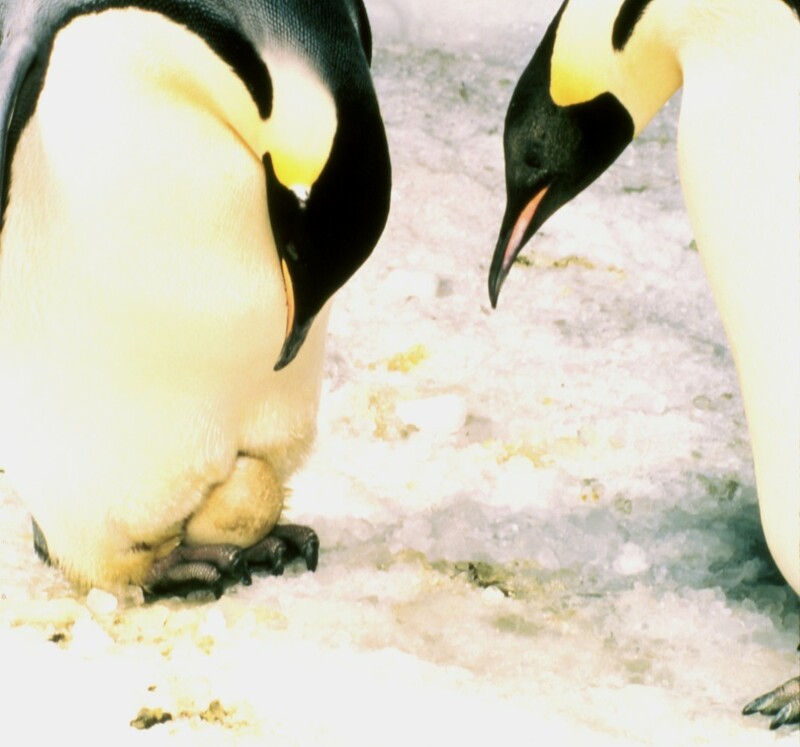 To survive in such low temperatures, emperor penguins have very special adaptations. They have large stores of insulating body fat and several layers of scale-like feathers that protect them from icy winds. They also huddle close together in large communities to keep themselves, and each other, warm. These huddles can contain thousands of birds and the penguins constantly change positions so that no-one is left in the middle – where it can be too hot – or on the edge – where it is too cold – for long. The Antarctic winter starts in April and this is when emperor penguins meet to breed on the thick Antarctic ice. After the female lays an egg, her nutritional reserves become depleted and she must return to feed in the ocean for two months. This leaves the responsibility of keeping the egg warm through the freezing Antarctic winter to the father. He subsequently spends the next two months holding the egg precariously between the tops of his feet and his brooding pouch, without feeding, throughout the brutal winter, when freezing winds can reach 120 mph. If he moves too suddenly or the egg becomes exposed to the freezing temperatures, the chick will perish. But his dedication, and his balance, ensures the survival of a new generation, and if the chick hatches before its mother returns, he produces a curd-like substance, which he regurgitates to keep the baby fed. By the time the female returns, sleek and full of food, the male may have lost 45% of his body weight. Ravenously hungry, he leaves to feed at sea. The offspring grow rapidly in summer when food at sea is plentiful and by December, the chicks are ready for life on their own. Males are so important to the brooding process that females seek out well-developed partners who can sit on eggs longer without food. This epic feat of endurance and sacrifice makes emperor penguin fathers some of the most extraordinary and dedicated dads in the world.